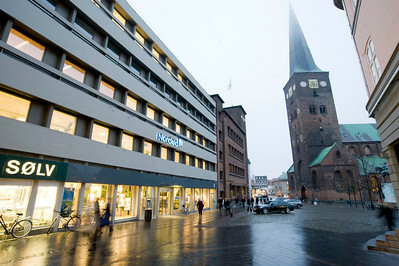 The site-exhibition is situated in the basement under the Nordea Bank building near the cathedral of Aarhus in the center of the city. 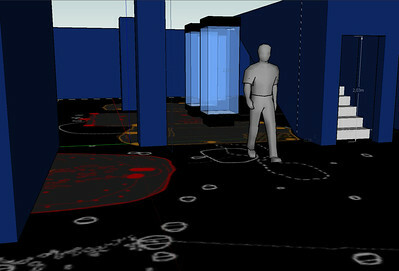 A museologic case-story on the process and the phases of producing a site-exhibition in 2008. 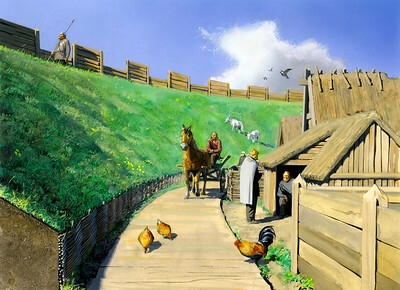 The exhibition displays the life inside the fortressed Viking Age city Aros (Aarhus) around year 950. 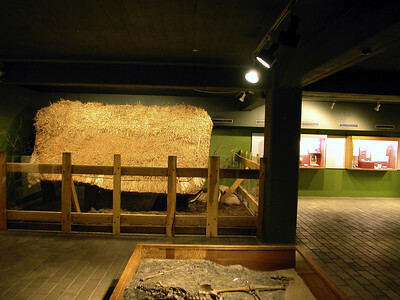 The site-exhibition is a part of Moesgård Museum, who excavated the site in 1963-64, before a new bank was to be built. 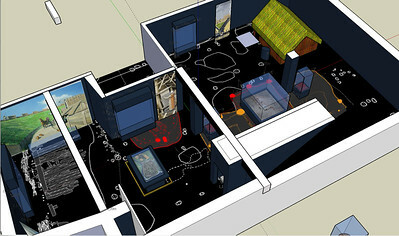 The concrete basement was later used for the first site-exhibition. 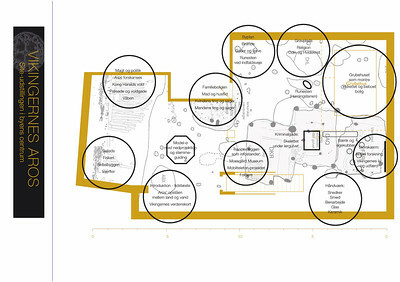 The 2008 Exhibition layout and design: Jens Kirkeby. Writer: Martin Djupdræt. 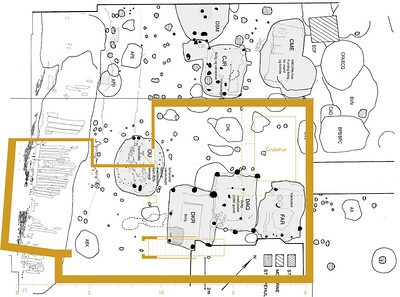 Archaeological supervising: Hans Skov. 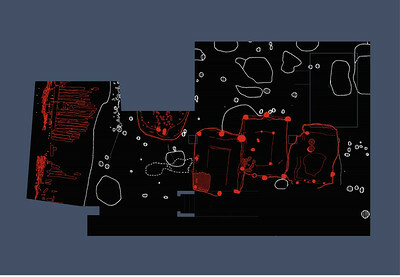 Wall paintings: Erik Sørensen. 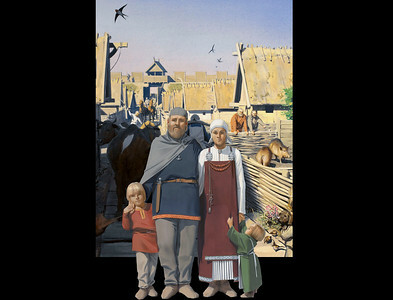 Restauration and technique: The staff at Moesgård Museum. 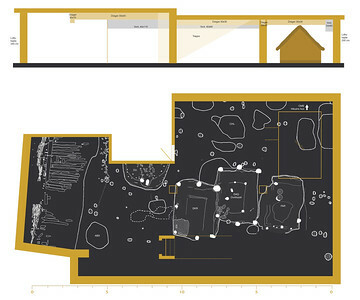 The exhibition room walls (yellow) on the complete excavation area, showing pit-houses (grey). The old exhibition from 1968 as i stood early 2008 before closing down. The room is expressing the colours and materials from the late 1960ies - with extensive use of particleboard. 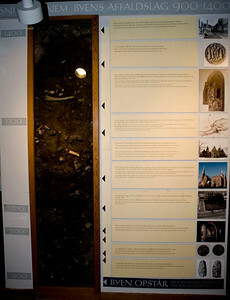 The vertical cut through the earth-layers was to be re-used in the new exhibition. 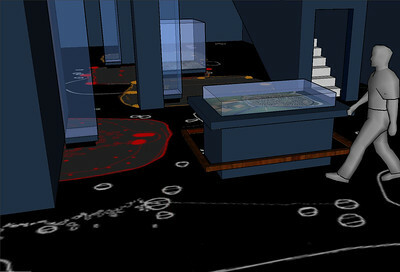 The inside of the the ring fortress runs through the edge of exhibition. 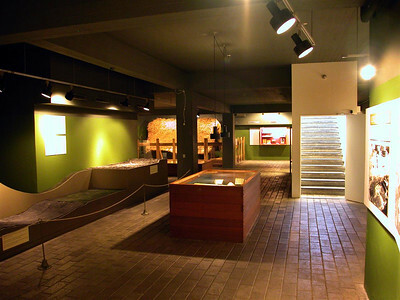 The planks are original and will be on display in the new exhibition. 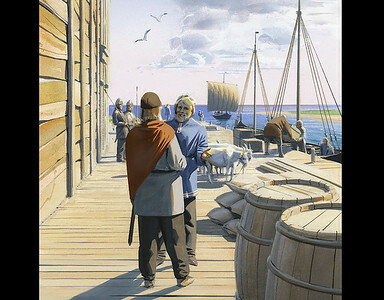 Viking crime? 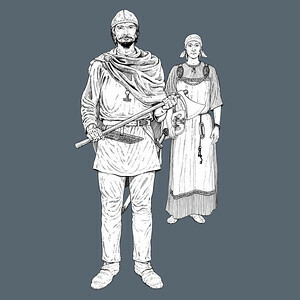 - The body of man was hidden in the ground under the floor in one of the pit-houses - definitely not a decent grave for a Viking. He is the oldest Aarhus citizen found till now. His left femoral bone is sent to age determination research. His right hip joint shows a partly healed injury. He was a limping cripple, and furthermore the poor man's head was missing when he was excavated. 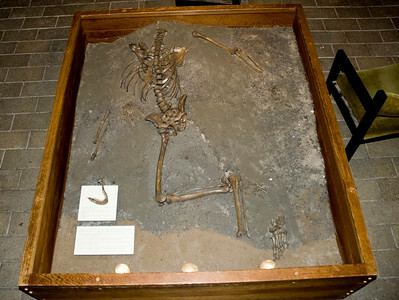 This skeleton will also be on display in situ in the new exhibition. 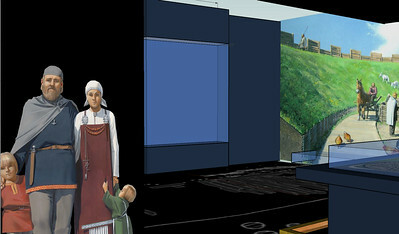 An instructive but rather hidden reconstruction of a pit-house is built in the exhibition. It wil be re-used. 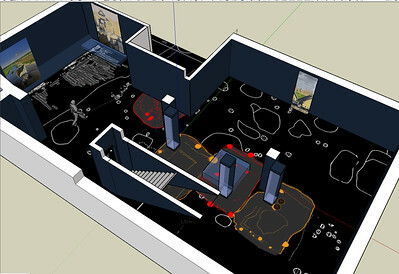 A more precise scaling of the exhibition floor and the excavation plan. Inspiration? 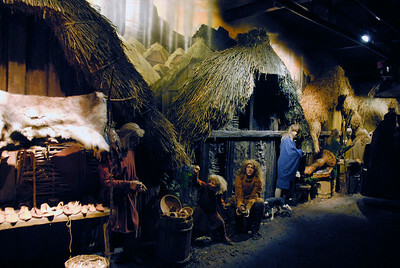 - A view to the vikings in York, England from the gondols driving through the big site-exhibition with smell and sound. An rough sketch of the themes. The public may have a direct life-size meeting with the vikings - as here from the great English-Danish Viking Exhibition 1981. 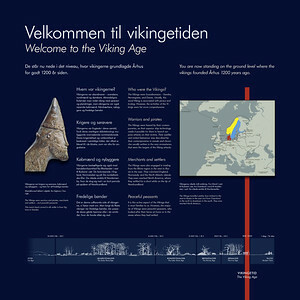 Our more friendly life-size viking family welcoming the visitors to their world. 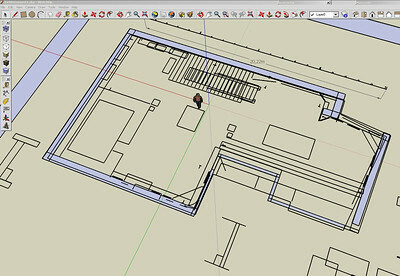 A 3D start in the small program SketchUp. 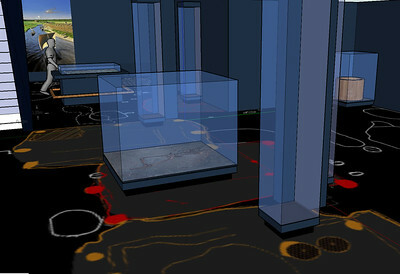 The four houses and the road planks will be projected down on the floor in red light. A nice and quick little program for visualizing. Sketching ... the skeleton is in place. A new model is in place. View from the entrance as a kid will see it. 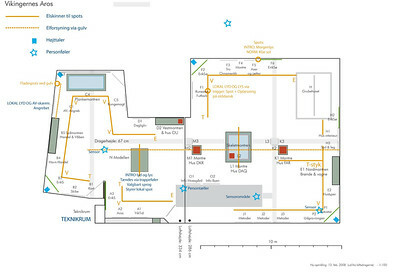 The first electricity ceiling and floor plan with speakers, visitor counter and light sensors. A type poster. The red line goes up from the floor and starts at the lowest step (year 980) on the entrance stairs. A view to the ships outside the fortress. 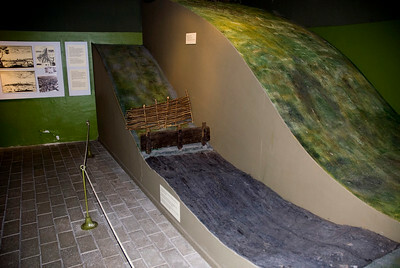 The planked road inside the fortress wall - a full wall painting matching the original planks displayed in-situ on the floor..
A hang-up construction. 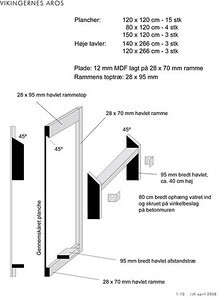 The posters will have a 6 cm distance to the wall to hang free. 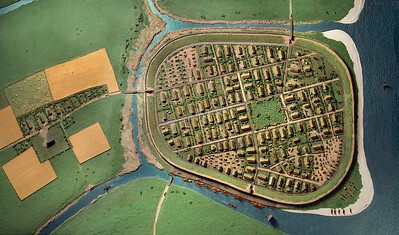 Aerial view on the beautiful model. 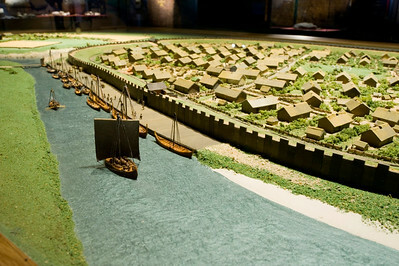 Closer view at the model. Select language for a 2 min sound intro. 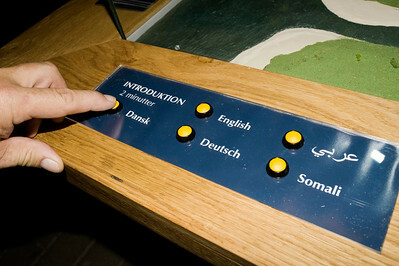 The tourists understand English and German, and Somali and Arabic speaks can help newcomers to be introduced to the Danish cultural heritage.